Barry Pearl, F.F.F. : A Life in Comics! It's a great shame for comicbook fans, Barry. And to think that you had his email address and could write to him whenever you liked. Let's hope that the anti-Stan brigade have the decency not to gloat, or to try and diminish his well-deserved reputation as the chief architect of the Marvel universe. A very sad day indeed. Well said kid.Any anti-Stan brigade should have the decency to keep their mouths shut.Happy that Roy got to see him one last time and also deliver him the book.No matter what Stan should have left this existence knowing he had the love of many people and I hope that he was fulfilled with everything he has done. He has a tremendous legacy. I'd heard that Stan had recorded several cameo appearances in advance, John, so we'll hopefully still get to see him in a few Marvel movies-to-come. Kirby, Ditko, and now Lee gone. It's hard to believe. The end of an era in fact. As you say though, a tremendous legacy. Thanx Kid and John. There would be no Marvel Age without him. Thank you for a heartfelt tribute to a gentleman who brought us much joy in our youth and beyond. Stan Lee's enthusiasm for comic books came through in his stories, letters pages, editorials and, of course, in person. The last of the triumvirate of Marvel pioneers has left us, but he will not be forgotten. Excellent compilation of "grieving scenes." All father Odin, we who be immortal are oft times tempted to forget the meaning of mortality‑‑that life is but a temporary gift for most. A man cannot exist without the knowledge that he may forfeit that gift whenever he places himself in the path of peril...yet men do risk their lives , and sometimes lose them, for many and varied reasons...and the greatest of these...is love. Tom,at Marvel we have learned that death is not necessarily fatal, maybe Stan will come back as many of his characters did. Thanks, Barry. That's a lovely thought. I appreciate your tribute to Stan very much. I'm surprised at how overwhelmed I feel by his passing. I knew that he and Marvel were/are a big part of my life. I failed to realize just how much. 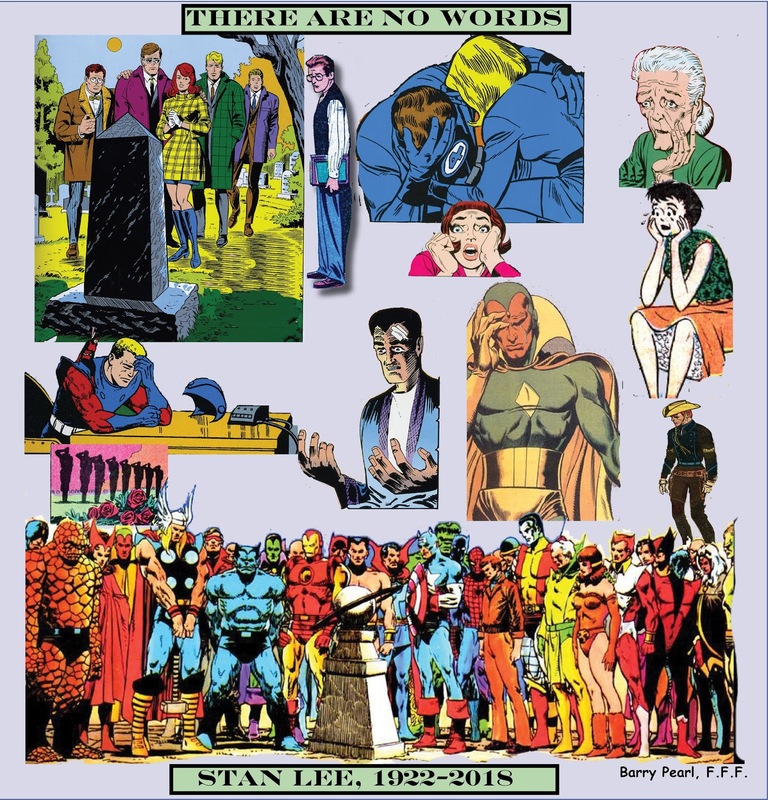 Very nice tribute Barry , Stan and the rest of the gang have been part of my life for such a very long time. Coming Soon: This book is about the Marvel Age of Comics 1961-1977. Every single story, every single comic is covered here. That is about 5,000 comics including the reprint comics and black and white magazines. An incredible Timeline of the Marvel Age (1900-1976) which features the publication dates for every comic and highlights from the History of Timely/Atlas/Marvel. The title, date, number, summary, related links and full credits (editor, author, artists, plotters, letterers, etc.) to all the comics of the “Marvel Age.” The full cover credits too! Every comic is also rated, from zero to four stars. We also tie up the loose ends of the series that didn’t finish. Character Map: A separate list of the guest appearances of every Marvel hero or major villain in their published chronological order. “Not Necessarily” the Marvel Age Publications, featuring Evel Knievel, FOOM, Pussycat, Captain Britain, Spidey Super Stories, Marvelmania and more. Reproduction of fifteen years of Marvel merchandising, from pillows to sweat shirts to the M.M.M.S. to Hostess Twinkies. Multimedia of Stan, Kirby, Romita and others. Also, Hundreds of quotes unique to this book. Notes and commentary, on the creators and the actual stories.